Burundi is a landlocked, resource-poor country with an underdeveloped manufacturing sector. The economy is predominantly agricultural; agriculture accounts for just over 30% of GDP and employs more than 90% of the population. Burundi’s primary exports are coffee and tea, which account for 90% of foreign exchange earnings, though exports are a relatively small share of GDP. Burundi’s export earnings – and its ability to pay for imports – rests primarily on weather conditions and international coffee and tea prices. An ethnic-based war that lasted for over a decade resulted in more than 200,000 deaths, forced more than 48,000 refugees into Tanzania, and displaced 140,000 others internally. Only one in two children go to school, and approximately one in 15 adults has HIV/AIDS. Food, medicine, and electricity remain in short supply. Less than 2% of the population has electricity in its homes. 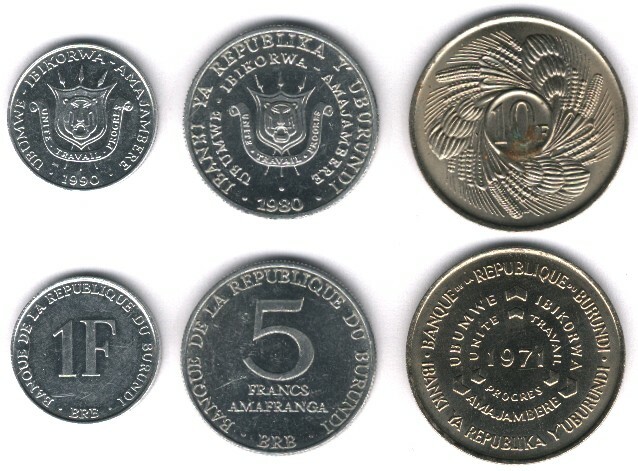 Burundi’s GDP grew around 4% annually in 2006-12. Political stability and the end of the civil war have improved aid flows and economic activity has increased, but underlying weaknesses – a high poverty rate, poor education rates, a weak legal system, a poor transportation network, overburdened utilities, and low administrative capacity – risk undermining planned economic reforms. The purchasing power of most Burundians has decreased as wage increases have not kept up with inflation. Burundi will remain heavily dependent on aid from bilateral and multilateral donors – foreign aid represents 42% of Burundi”s national income, the second highest rate in Sub-Saharan Africa. 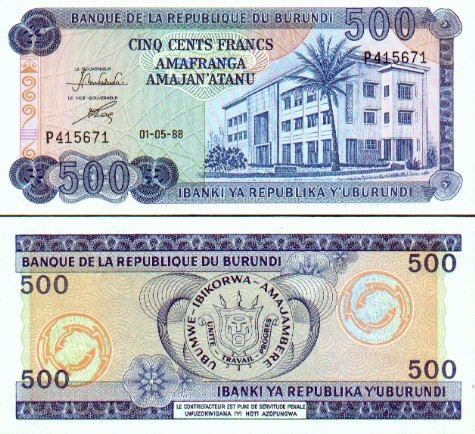 Burundi joined the East African Community in 2009, which should boost Burundi’s regional trade ties, and also in 2009 received $700 million in debt relief. Government corruption is hindering the development of a healthy private sector as companies seek to navigate an environment with ever changing rules. 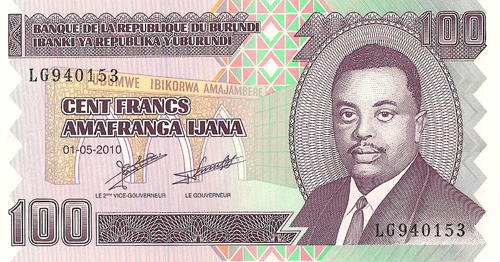 This entry was posted in Histronomics and tagged african currencies, burundi. Bookmark the permalink.